You can use the OverDrive app to read borrowed ebooks on your Chromebook. Note: If you'd rather read ebooks in your Chrome web browser, you can use OverDrive Read instead. 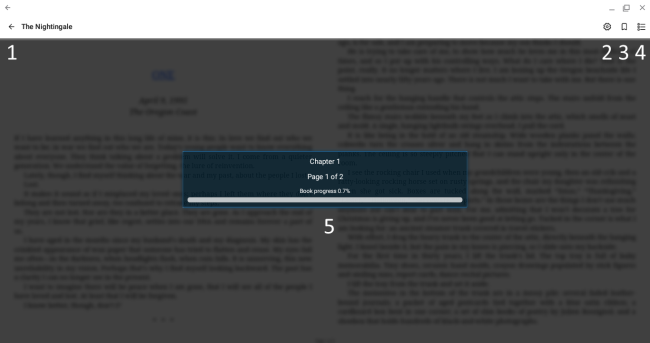 To move forward or backward in the book: To go to the next page, click or tap the right side of the screen. To go to the previous page, click or tap the left side of the screen. To look up a word in the dictionary: Click (or tap) and hold a word, then select the magnifying glass. You can also look it up on Wikipedia using the drop-down menu below the search field. To open a hyperlink: Click (or tap) and hold the link. To see your progress and access more reader options: Click or tap the middle of the screen.